No, that's not it. He's all things a Santa should be. He's jolly and friendly, great with kids, rosy cheeked with a twinkle in his eye. But there's more. When he is with your kids, talking to them and talking to you, you can tell that he knows he is Santa. There's also the odd fact that in all the years I've seen him at the Mall, it doesn't seem like he's aged a day. But here's why I know he is the real Santa Claus. Last year Santa made me cry - in a good way. So we waited and we saw Santa. He's in a little cubicle area so you can only see him as you round the corner, after waiting in a short line. It's crowded with books, toys, a Christmas tree, a big puffy chair for Santa to sit in, and it is brightly lit as there are elves and helpers who take pictures and video, while you and your children visit with Santa. Aliza talked to him first while we worked on getting the boys to at least sit down next to Santa's big puffy chair. Santa got down on the floor then and talked to the boys, tried to ask their names, but they were anxious and upset and wanted nothing to do with him. I sat down with them so they wouldn't take off. AJ tugged on his beard a bit, but mostly he just wanted to leave. Santa asked AJ what he wanted for Christmas, and I told Santa the boys were nonverbal (which they were more or less, a year ago) but that Aliza was going to tell him what her brothers wanted. She was very starstruck, but she managed to remember to say they wanted a train. Anyway when our Santa Experience was over, we struggled with ferociously overstimulated boys, getting them settled back down in the stroller so Mark could take them for a walk through the mall and calm them down. This took several minutes, during which time Aliza stood by waiting for us. This is nothing new for her. But Santa saw her watching, and waiting. 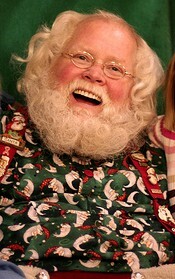 While I was strapping one of the boys down in the stroller I glanced back, and she was back sitting on Santa's lap. It looked like they were having an intent conversation. Once we got the boys settled, we headed out to the lobby to look at our pictures and see if any of them turned out at all. Mark and I were pretty stressed over how uncooperative the boys were -- well, at least I was. The whole time they were yelling and struggling to get away and I was struggling to hold them down and comfort them, I was very conscious of everyone else watching us. A few moments later, Mark had taken the boys out into the mall hallway to walk them and Aliza and I were at the counter to pay for our pictures. I looked back to make sure Aliza was right behind me, and saw that Santa had come out of his little cubicle and was standing there with one arm around her, bent over, talking to her as if he was telling her a big secret. Her eyes were like saucers. Then Santa looked up at me and smiled and said "She's a good helper, isn't she? She's a very good big sister." He looked so out of place out there in the lobby -- it's all regular people out there, hustling and bustling, and he's such a huge, colorful, shining character.....and he came out especially to talk to Aliza. I said "she sure is a good girl." And I was so touched at how he came out of his designated Santa-area just to talk to her and let her know how special she was, that I nearly bawled. And now, a year later, I nearly bawl just telling the story. She asked for an American Girl doll last year, and I wanted to buy her a bunch of them. I wanted her to get everything she told Santa she wanted, tenfold. He is the real Santa. Aliza knows it too. this certainly got my tears flowing - what a special Santa! That was just beautiful. What a great guy he is. A couple of years ago there was a Santa at the BV Center and he was amazing. He just loved being Santa and he took the time and was so sincere. We would see him shopping there in the non-Santa months and kids just flocked to him and he was so JOLLY even in the summer! He was magical. Now there is another guy. Hmpf. I made the mistake of saying one year when my favorite Santa wasn't there, "Oh the bad Santa is here" and I thought Emily was going to die! I had to explain that there are a ton of other Santas because the "real" one was busy making toys. Made me cry to read it too!